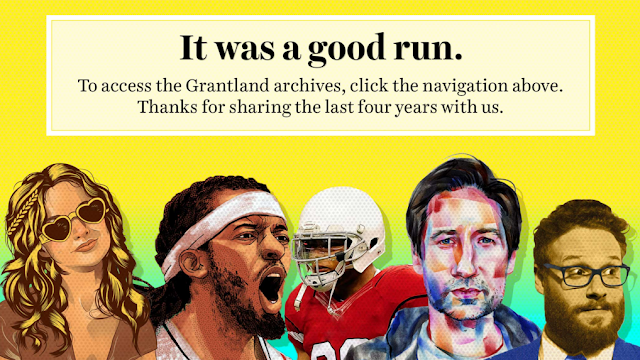 We Defy Augury: Without Grantland; Where to? "My favorite website just closed down. Which other ones should I be visiting instead?" Rafe Bartholomew: New York Times. Amos Barshad: I don't say this lightly—I really feel like, out of respect, in the wake of Grantland's demise, people should stop reading altogether. Andy Greenwald: Did I write this question? Holly Anderson: Anything my esteemed writing partner and probable cousin Spencer Hall types onto a screen, anywhere. Start here. Jonah Keri: Go support Lowe, Barnwell, and McIndoe at ESPN.com, Rembert at New York Mag, Wesley at the New York Times, the Chris Ryan and Andy Greenwald podcast on Simmons's network, Lindbergh and Goldsberry at FiveThirtyEight, and anything Pierce, Litman, Conn, Bartholomew, Anderson, Barshad, Brown, Lambert, Mays, Goodman, Hyden, Thomas, Phillips, Curtis, Concepcion, Schilling, Shoemaker, Lisanti, Baker, Abrams, Pappademas, Baumann, Chau, Sharp, Hinton, O'Hanlon, Jacoby, Jazayerli, Serrano, Lynch, Yoshida, and Titus do anywhere. Jason Concepcion: Get rid of your internet altogether and move to the woods. Brian Phillips: Don't read the internet; read the print edition of Vanity Fair.